SINGAPORE - Wednesday's (Nov 25) rail disruption along the North-South Line, which affected tens of thousands of commuters during the morning peak, is worrying on two counts. First, it involved yet another electrical fire. Fires in a mass transit system, no matter how small, can have catastrophic consequences. And there has been one too many recently. Earlier this year, a circuit-breaker fire shut down the Bukit Panjang LRT system for a day. In 2013, a short-circuit fire broke out near Newton, engulfing the station in smoke and disrupting service for two hours in the morning peak. In 2004, a fire broke out in the tunnel near Newton, apparently also caused by a short circuit. Wednesday's fire on the North-South Line was said to have been ignited by a flashover at a tie-breaker (a kind of circuit breaker) in Ang Mo Kio MRT station. The blaze was put out by the Singapore Civil Defence Force at 5.50am. A flashover is an unintended discharge of current, which can leap across voids. It can happen when a system is stressed with a higher-than-usual electrical load. Was the system under a higher-than-usual load, with additional trains and newer and heavier ones? SMRT would not comment. There was a strong suspicion that a heavier-than-usual electrical load had caused the Bukit Panjang LRT fire. On the other hand, Wednesday's incident happened before service started for the day, so load could not have been the likely cause. According to the Land Transport Authority (LTA), disruptions caused by power and trackside faults more than doubled between 2011 and last year. 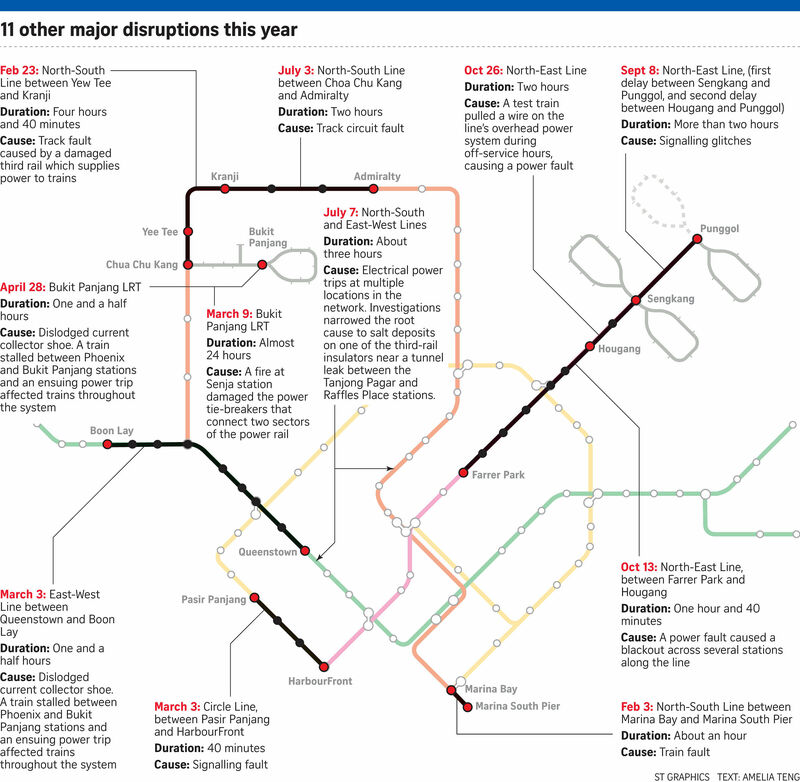 In 2011, they accounted for eight incidents or 2 per cent of all disruptions. Last year, they were responsible for 16 incidents or 5 per cent of incidents. The unprecedented networkwide breakdown on July 7 this year was also caused by an electrical fault - although there was no fire. Why is the system experiencing such a surge in electrical faults? If this electrical problem is not tackled, a tunnel fire might one day happen with serious consequences. The second worrying thing about Wednesday's breakdown was what the LTA chief executive said in its aftermath. Mr Chew Men Leong, talking to reporters at Ang Mo Kio station on Wednesday morning, described the incident as a "localised" one. 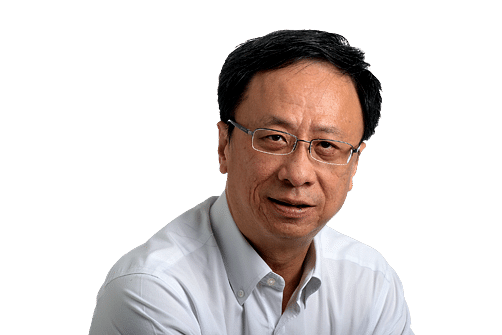 Although Mr Chew was speaking off the cuff, the comment downplays the gravity of the situation unnecessarily. Rail breakdowns are rarely "localised", unless it is a glitch on the Sentosa monorail. A breakdown on an MRT line, which can account for one million trips a day, impacts not just people in a particular stretch. It affects commuters both upstream and downstream of the affected stretch. In fact, it can reverberate across the entire rail network, as transfers are disrupted and train platforms become overcrowded - often in an instant. It impacts bus commuters, taxi availability and road traffic as affected commuters spill out of stations onto the streets in search of transport alternatives. A rail breakdown - especially during peak hours - easily impacts tens of thousands of people. A country's productivity is affected as a consequence, not to mention students who are late for exams. What Mr Chew said on Wednesday morning about SMRT being able to recover from the situation quickly was spot on, though. City-bound trains on the North-South Line were running at intervals as short as one minute after the incident. This was possible because drivers overrode the system and drove the trains manually. This helped to clear the crowd quickly. Checks by The Straits Times at Bishan interchange found that trains went from fully packed at 9.15am to having ample standing room by 9.30am. Trains on the adjoining Circle Line were running at intervals of as short as two minutes, even though the electronic notice board said four. That helped to dissipate the crowd on the platform that was filled continuously by people transferring from the North-South Line. In this instance, it is clear the operator managed its recovery process well, and that mitigated the impact of the breakdown somewhat. The challenge is, of course, to prevent a repeat of such breakdowns. Although the number of breakdowns can never be zero, the rising incidence of electrical faults and fires forms a worrying pattern that cannot be ignored.